No matter our native language, we all have to learn a writing system. And whichever language we learn, its writing system had to come from somewhere. Take English, the language you're reading right now and one written in Latin script, which it shares with a range of other tongues: the European likes of French, Spanish, and German, of course, but now also Icelandic, Swahili, Tagalog, and a great many more besides. The video above by Matt Baker of UsefulCharts explains just where this increasingly widespread writing system came from, tracing its origins all the way back to the Proto-Sinaitic script of Egypt in 1750 BCE. As revealed in the video, or by the poster available for purchase from UsefulCharts, the letters used to write English today evolved from there "through Phoenician, early Greek and early Latin, to their present forms. You can see how some letters were dropped and others ended up evolving into more than one letter." The color-coding and direction dotted lines help to make clearly legible what was, in reality, an evolution that happened organically over about two millennia. Enough changed over that time, as Jason Kottke writes, that "it’s tough to see how the pictographic forms of the original script evolved into our letters; aside from the T and maybe M & O, there’s little resemblance." Baker's design for this poster, notes Colossal's Kate Sierzuputowski, "was created in association with his Writing Systems of the World chart which takes a look at 51 different writing systems from around the world." 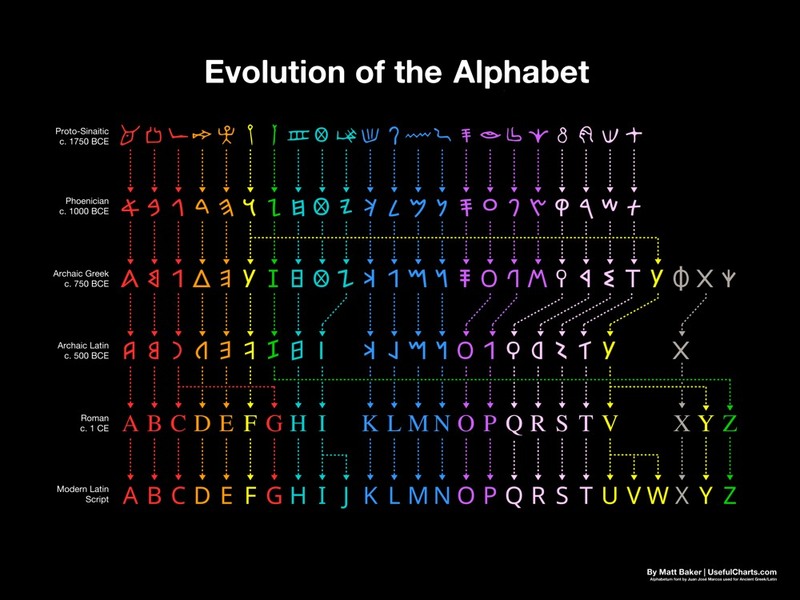 All of the research for both those posters informs his video on the history of the alphabet, which looks at writing systems as they've developed across a variety of civilizations. You'll notice that all of them respond in different ways to the needs of the times and places in which they arose, and some possess advantages that others don't. (In Korea, where I live, one often hears the praises sung of the Korean alphabet, "the most scientific writing system in the world.") But what the strengths of the descendant of modern Latin 2000 years on will be — and whether it will contain anything resembling emoji — not even the most astute linguist knows. ‘Proto-Sinaitic’ should be pronounced properly. SIN-AYE-ATTIC will not do. the Greek alphabet existed in many different local variants, but, by the end of the fourth century BC, the Eucleidean alphabet, with twenty-four letters, ordered from alpha to omega, had become standard and it is this version that is still used to write Greek today. These twenty-four letters are: Α α, Β β, Γ γ, Δ δ, Ε ε, Ζ ζ, Η η, Θ θ, Ι ι, Κ κ, Λ λ, Μ μ, Ν ν, Ξ ξ, Ο ο, Π π, Ρ ρ, Σ σ/ς, Τ τ, Υ υ, Φ φ, Χ χ, Ψ ψ, and Ω ω. …which all Greek people still use to the day. Thus, someone how speaks modern Greek can actually read the Rosetta Stone in the British museum. Also, further down that page you can see digamma (F) and koppa (Q) that also existed in the not Archaic Greek Alphabet. I do believe there is very valuable and quite important missing information in the evolution that is described above. Your friendly neighborhood Greek person. I am surprised that Amazigh Tifinagh isn’t there. It represents an ancient alphabet that really survived and now neo tifinagh is taught in schools….